In just a few weeks Mother's Day will be here and its the perfect time to show Mom how much you love her with a custom wood photo gift. Plywerk offers the perfect gift for Mom that will give her something to smile about for many years to come. How is this for original? It's so simple too! Just select the image you like for the front and then upload your own photo for the back. Mom will just love this! You will of course get bragging rights for buying such an awesome card too. 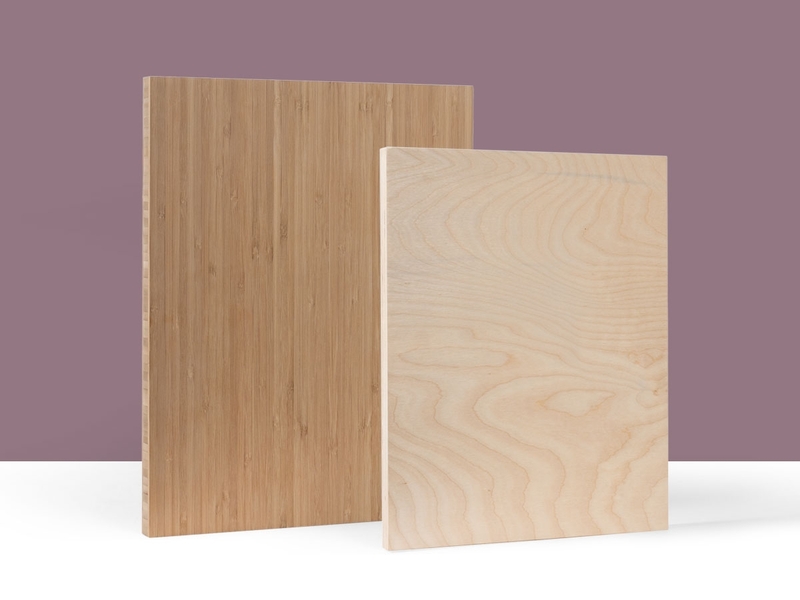 Select your wood card image from one of these four options. Now all you need is that special gift to go with the card. How about a heart shaped wood print to display your favorite family photo on it? Mom's love to display photos of their family and this heart shaped print is the perfect choice. Don't have any wall space left.....we have you covered. How about a desktop wood print block? No need for a lot of space for this, it can simply sit on any mantle, shelf or desk. See, now you have all you need to help make Mom feel loved on this special day. Don't wait too long, place your order by May 1st in order to receive this by Mother's Day. This entry was posted in Custom Wood Print, Direct Printing, Gifts, Greeting cards and tagged custom photo gifts, photo mounting, Prints on bamboo, prints on wood, wood photo mounting, custom wood print on April 20, 2018 by Erin Swinfard. I don't know about you, but I'm tired of the frame game. Yes, my photos need a makeover and I have the perfect idea. Check out Plywerk's new Lolly Blocks! This is one cool, simple way of posting your most favorite photos around the house. 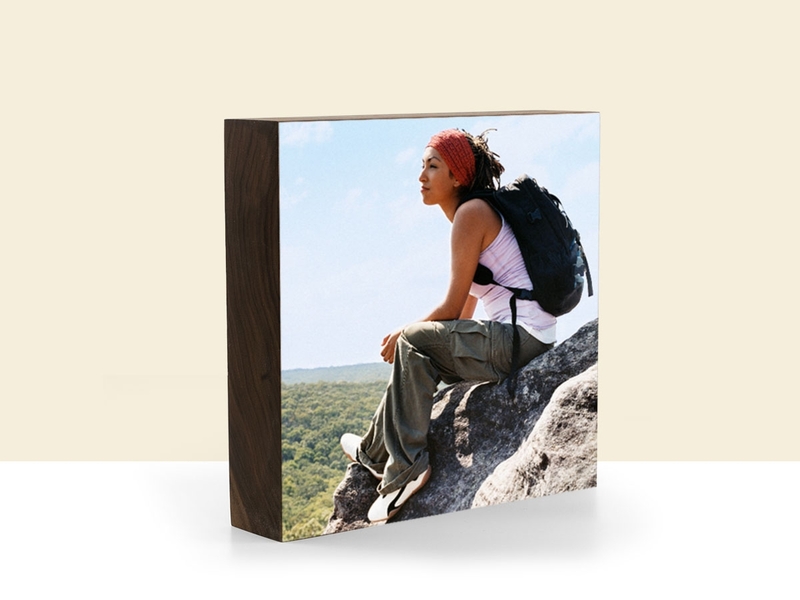 Lolly Blocks are designed out of 100% bamboo wood and makes any of your photos look amazing. Feelin' the love? Plywerk's heart Lolly Block is the perfect gift for the newly married couple or for your own family photos. How many times have you needed a gift and have no idea what to get that friend or family member who has "everything?" This is what I love about these Lolly Blocks, they are fun, creative, unique, affordable and versatile. Photo wood printing is not just a trend, it's a style that shows off your amazing taste that will last for years! I can't wait to get started and give my photos the Plywerk makeover. How about you? This entry was posted in App Review, DIY, Eco-Conscious, Gifts, More Than Just Green, Photo Display Products, Photo Collage, frames and tagged bamboo wall art, beyond plywerk, custom photo gifts, eco-friendly, home decor, photography, wedding photography, wood photo mounting on July 7, 2017 by Erin Swinfard. Is your home starting to feel small and cluttered due to all the items you own? No more space to display a gift? Are you tripping over items on the floor? No space to work on your tables or desks? Don’t worry! You aren’t the only one with these problems. When my space started to become cluttered the last thing I wanted to do was throw things out… I enjoy everything I own and wanted to keep everything so I knew I needed to find a way to sort and organize my items ASAP. I tried looking at shelves and other organizers but I just didn’t have the space for them! That’s when I realized the Boo Boxes were perfect for me. With no more space on the ground to utilize, my walls were my only option left. My favorite thing about the Boo Boxes is that they come in so many different shapes and sizes. They come in the simple square but also come in a more fancy hexagon bamboo shelf and others shapes as well. It’s a simple piece that adds so much more style to a room. It doesn't take much to mount and doesn't require the space a normal organizer would. Not to mention they are able to hold and display your items in such a cute, stylish way! My favorite thing to display in these boxes is definitely plants! But they can hold and display so much more… You can display your mugs, photos, prints, sculptures, books, the options are endless! What would you display? Check out these Boo Boxes here! They will definitely change your home’s environment instantly. Hope you like them as much as I do! This entry was posted in Eco-Conscious, Gifts, Handmade in California, Handmade in Portland, Holiday Gifts, Boo Boxes and tagged Bamboo, home decor, modern home decor, Plywerk, wood photo mounting, bamboo hexagon shelf, bamboo home decor, bamboo shelf, modern bamboo shelf, modern hexagon shelf on April 6, 2017 by Erin Swinfard. Are you still out shopping for the perfect gift for your loved ones? Here's an idea for the dog lover! Get them a custom photo print of their favorite furry friend! 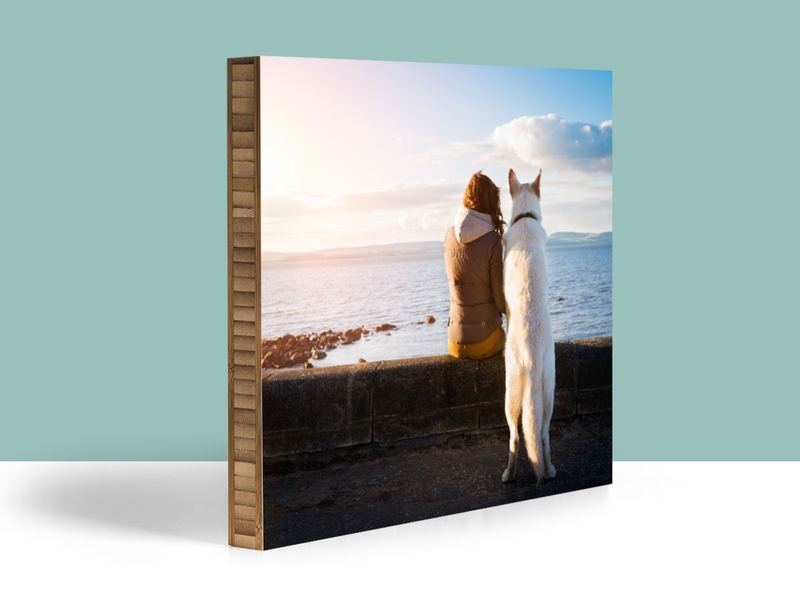 A picture of their dog is a perfect gift for any dog lover or family just loves their dog. You don't have to stop there either! We offer different kinds of custom photo trinkets and ideas that are a perfect gift for dog lovers! 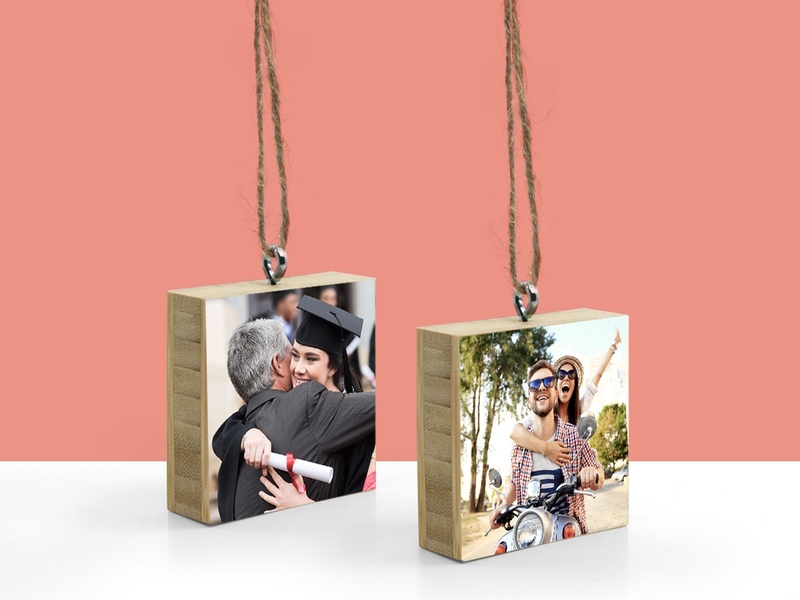 For example, give your loved ones a bamboo custom photo ornament of their favorite pal, or surprise your family with a new puppy and get their paw printed on a custom photo wood print. At Plywerk, we work hard to provide awesome gift ideas for you and your loved ones. For more ideas, check out our holiday gift guide. You'll find some ideas that can be used for any person, or in this case, for dog lovers. This entry was posted in Custom Wood Print, DIY, Gifts, Holiday Gifts and tagged Bamboo, Bamboo photo mounts, holidays, home decor, modern home decor, Prints on bamboo, prints on wood, wood photo mounting on January 17, 2017 by Erin Swinfard. Looking for something modern to add with the Maggie frames? Try out our Bamboo boxes, also known as the Boo Box! Each Boo Box is custom made and comes in a variety of shapes and sizes, from the classic rectangle to hexagons, and even a large Trap Boo Box! Pair these with your Maggie frames, at home or in the office. Are you looking for some cool trinkets to match these with? Check out some of our desktop blocks! These matching 1.5" bamboo blocks will go great with your matching Boo Boxes or with the Maggie frame. For more home decor, check out some of our ideas and inspiration! This entry was posted in Blog, Custom Wood Print, Direct Printing, Eco-Conscious, Gifts, Handmade in California, Holiday Gifts, Photo Display Products, Maggie and tagged art mounted on bamboo, Bamboo, bamboo art panel, bamboo photo mounting, bamboo wall art, eco-conscious, eco-friendly, eco-friendly picture frame, holidays, home decor, magnetic photo frame, modern home decor, Prints on bamboo, prints on wood, wood photo mounting on November 2, 2016 by Erin Swinfard. Alright guys, today we’re going to get a little crazy. Hold onto your hats because we’re going to tell you about the super rad things you can do with the help of the Library of Congress. Wait! DO NOT STOP READING. Really, there is something pretty cool that you should know about the Library of Congress and not everyone is aware of it. And that’s how you know it’s cool. You can find all sorts of fun images on the Library of Congress website! The Library of Congress happens to have one of the largest photography collections in the United States. Some of the images are available online and they’re pretty much yours for the taking. Or using, rather. So, that’s good news for folks who want to create their own photo art, but don’t TECHNICALLY own a camera. So get on board with the Library of Congress free images. There is something for everyone in the image catalog on the Library of Congress website - for free! The Geiranger Fjord in Norway can live on a Plywerk on your wall right now thanks to the Library of Congress. So check it out, y’all. Don’t let all these images go to waste. 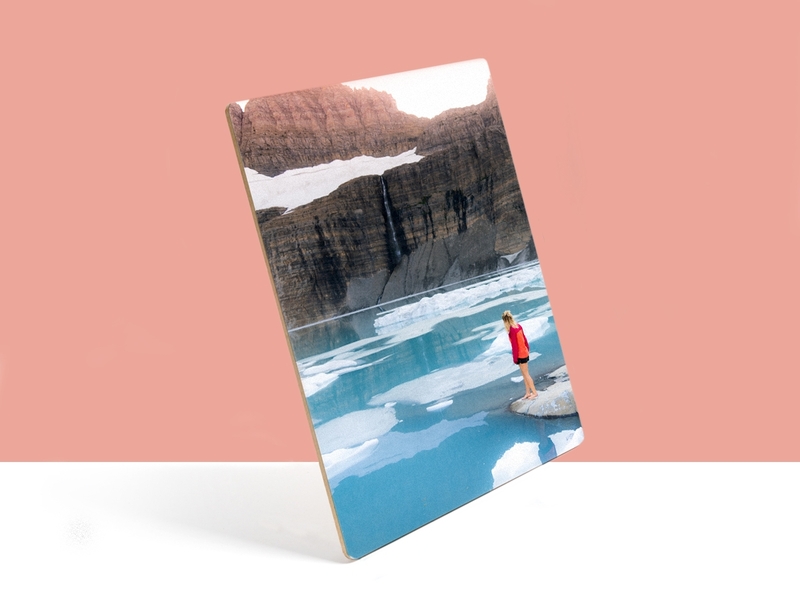 If you want a picture of Norwegian fjord and you’ve never been to Norway, don’t let that stop you from creating your very own wood-mounted print of a fjord. The library is your oyster. Hop to it. And we’ll help you out. All you need to do is download, upload, and we’ll do the rest. And you’ve got your fjord art. This entry was posted in Beyond Plywerk, Photography and tagged free images online, Library of Congress photos, Outdoor Photography, photo mounting, wood photo mounting on July 5, 2014 by admin. We see a lot of family photos here at Plywerk. And while every family is special and beautiful, some family photos are more memorable than others. That’s not to say that there’s anything wrong with your more ‘traditional’ family portrait. It’s always lovely to see the whole gang standing around the Christmas tree or huddled together on a beach. (Even if you’re wearing strange, matchy outfits.) But that’s not for everyone. Sometimes, we see more creative family photos. And that kind of makes our collective day. Plywerk your family photos in a creative way such as Jonathan Bolch did. We’re going to give a little Plywerk customer shout out today to Jonathan Bolch. He took family photos to a whole new place. Sure, you can get a nice snapshot at a portrait studio, but if you’re whiz with Photoshop, the possibilities are endless. And here’s the proof. So perhaps you’ll let the Bolch family inspire you. You too can get creative with your family photos and then have them Plywerked. If you want to recreate a Beatles or a Queen album cover with your loved ones, then you should do it. By all means, do it. Why be normal when you can be you? Go ahead and take some funny family pictures or strange family pictures. Because isn’t that kind of what families are? It can be hard to be creative. But it’s very easy to order a Print on Plywerk. So if you’ve already done the hard part, let us help you out and finish the job. If you’re proud of your unique family picture, get those pictures mounted on wood so you can hang them above the mantle for years to come. Go ahead and do something awesome or weird. Let your family’s personality shine through in your next picture. And when you do, please send it our way. We’d like to see it, too. It makes the job more interesting. This entry was posted in Photography and tagged bamboo photo mounting, creative family photos, family portraits, funny photos, wood photo mounting on July 3, 2014 by admin. There are countless ways you might use Plywerk this graduation season. Actually, hold on. I just counted and I came up with three. But who wants to do all that counting? Why are we even talking about counting? It’s summer! We don’t have time for things like math! We've got an array of products that any grad will love to put in their new diggs at college. If you’re the parent of a new grad, you’re probably thinking about ways to display senior portraits. You love your kids and you love pictures of your kids. Now, you finally have photos suitable for framing. And you paid a professional to take them. But instead of a boring old frame, consider mounting a picture on wood. We can take that picture of your grad standing in a meadow, or holding a soccer ball, or resting their head on their hand contemplatively, and make it into a piece of Plywerk. Proud parents, display your graduate's photos from when they were just a wee one to show how much they've grown! Decorating for a graduation party? Display your favorite photos from kindergarten to high school with our Maggie magnetic photo frames. Use them to showcase the best pics of your grad, and switch them out when the festivities have died down. It’s easy to swap photos in and out of the Maggie frame. Whatever you need, this graduation season, Plywerk can help. Happy Matriculating! This entry was posted in Photo Mounting and tagged graduation gifts, home decor, magnetic photo frame, wood photo mounting on June 13, 2014 by admin.